1. 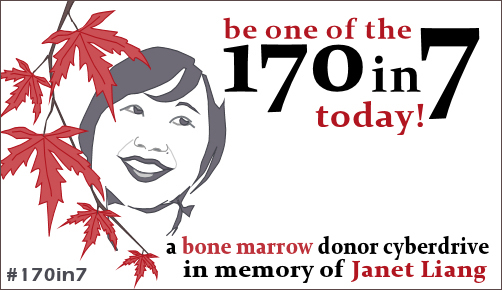 Click on the link: http://join.bethematch.org/TeamJanet. Fill out the forms to request a free, do-it-yourself cheek swab kit. If you don't have a Twitter account, send an email to jenn [at] reappropriate [dot] co to be counted! Donor registration is free for the donor because AADP and other non-profit organizations cover the costs of donor registration through charitable donations. 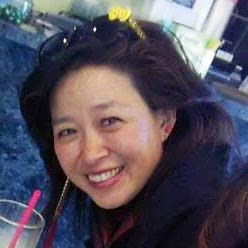 If you are unable to register as a bone marrow donor, please donate to AADP to help fund registration costs for other donors, or to the Liang family (PayPal account using helpingjanet@gmail.com as the recipient, or checks payable to "Janet Liang" sent to PO box 1526, Pleasanton CA 94566). 170 in 7 is a partnership between the following: 8Asians, AARisings, Angry Asian Man, Asia Pacific Arts, Asian American Donor Program (AADP), bigWOWO, ChannelAPA, Cheekswab.org, Disgrasian, Frances Kai-Hwa Wang, Jeff Yang (columnist, Wall Street Journal Online), Jook Time, Kimchi Mamas, Reappropriate, Rice Daddies, Schema Magazine, and a special partnership with Team Janet and Jeremy Needs You.